Recently, Rural Development Minister Mr. Jairam Ramesh & Food Minister K.V. Thomas floated an idea for the construction of intermediary warehouses for food grain at block level. However this is not an easy task considering the fact that at least 50 huge warehouses is needed across the country for implementation of Food security act. Currently, our food grain storage facility is grossly inadequate and suffers from inefficiency resulting into wastage of food grains. 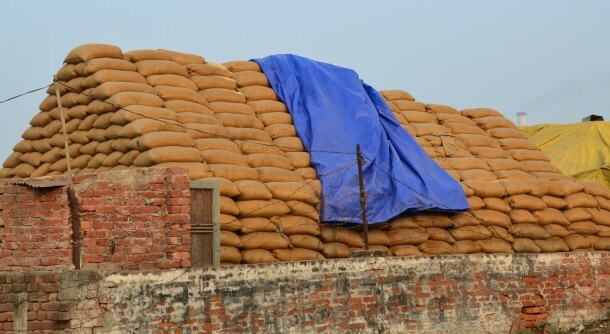 Further, once the National Food Security Act is fully implemented throughout the length and breadth of the country, need for more warehouses, shades and buildings to store foodgrains will only increase. A gross estimate expects spend of around $ 2.5 billion for creating these capacities. In 2009-2010 it was estimated that around 17 thousand tons of grain were wasted due to lack of storage capacity and approximately 30% of the total food grains are wasted even today. 1. Capital : Government cannot finance 100% capital (for one warehouse crores of rupees is required). 2. Land : Adding to this is the problem of scarcity of land accentuated further due to Land Acquisition Bill which makes it more difficult for private players to acquire land for making these warehouses (due to crunch of capital and scale of project onlu Public-Private Partnership route seems viable). 3. A regulatory system : After soliciting private players to invest, a regulatory body at the top will be the need of hour to make sure these investment doesnot go in vain and the interest of private players is maintained. 4. Coordination and understanding among multiple regulatory Bodies : Coordination among various ministeries involved in the project might crop up as the main hurdle (multiple clearances ,oversight and regulatory bodies). Likely problems in attracting Private Players in the project : Investment may not be that profitable as it will be an long term investment and will take some time before they can harvest some profit. WDRA was established in 2010 which is successfully developing and maintaining warehouses in India. However there are shortcomings in its objective due to various reasons necessitating private participation. But looking at the current work culture in the sector and the likely hurdles they might face, private players will need a strong leverage to attract them into this. WDRA aims to regulate and ensure implementation of the provisions of the Warehousing (Development and Regulation) Act, 2007 for the development and regulation of warehouses, Regulations of Negotiability of Warehouse Receipts and promote orderly growth of the warehousing business. It is an autonomous body headquartered in New Delhi. The WDRA Act specifies that the Authority shall consist of a Chairperson and not more than two Members to be appointed by the Central Government. (1) Subject to the provisions of this Act and any other law for the time being in force, the Authority shall have the duty to regulate and ensure implementation of the provisions of this Act and promote orderly growth of the warehousing business. (p) to exercise such other powers and perform such other functions as may be prescribed. CENTRE-STATE PARTNERSHIP : Under this model ,centre and state have decided to share the responsibility whereby Centre is going to give construction cost & states are supposed to give land to build warehouses. WHO WILL GET THE MAXIMUM BENEFIT OF THIS SYSTEM ? : States like Maharashtra, UP, Gujarat and Bihar would be the main beneficiaries of these schemes. WHAT IS COLD SUPPLY CHAIN SYSTEM ? : A system where a particular fruit is directly taken from the garden, kept in the refrigerated van at a particular temperature and whatever processes it pass through, it reaches in the same temperature to end consumer. e.g. the fruits coming to India from foreign countries. They look fresh as they have been transported to India using cold supply chain system. NCCD was established on February 9, 2012 as an autonomous body under Indian Government to positively impact and promote the development of the cold-chain sector in the country. Located at New Delhi ,It is registered under Societies Act & is chaired by Prime Minister. NCCD is run by a Governing Council, chaired by Secretary (A&C, Ministry of Agriculture) NCCD attracts participation from various private & government stakeholders ranging from Educational & Research Institutions, Regulatory authorities, Trade bodies, individual Companies involved as users or providers of cold-chain, farmer Groups and Associations as well as Individuals as Associate members. Each such member group also elects representation on the governing council, enabling NCCD to reflect inclusive governance and emulate a publicprivate partnership model. - Training, HRD and R&D Committee. - Committee for Strengthening Supply Chain & Logistics. - Application of Non-conventional Energy Sources in Cold Chain Infrastructure. - Technical Specification, Standards, Test Laboratory and Product Certification Committee. 1. Serve as a think tank to the government on the subject of coldchain : NCCD engages with its members to translate industry needs into policy recommendation. 2. Provide an enabling environment for cold chain sector and facilitate private investment for cold-chain infrastructure. 3. Direction setting to narrow the gap in the supply and value chain including storage, specialized transport and operational or business processes. 4. Address the concerns on standards and protocols related to coldchain testing, verification, certification and accreditation. 5. Assist in developing and promoting new and energy efficient technologies and their adaption in India. 6. Capacity building and training activities to reduce the gap in skilled human resources required for cold-chain sector. 7. Recommend guidelines to minimize environment impact and promote sustainability in the cold-chain. 8. Awareness programs on best practices for perishable product handling, indigenized for specific requirements and conditions.